Following are its Simple Terms. 1. By start now button, you will pay Rs. 5000 for our advertising service. 3. We will study your content and also review your sponsored reference link. 4. Your content will be the base of research and writing a new content. 5. If your content and sponsored reference link will follow our terms, your sponsored reference link will be published. Otherwise, we will refund your money in your bank account. Why should You show Advertisement on Our Website? 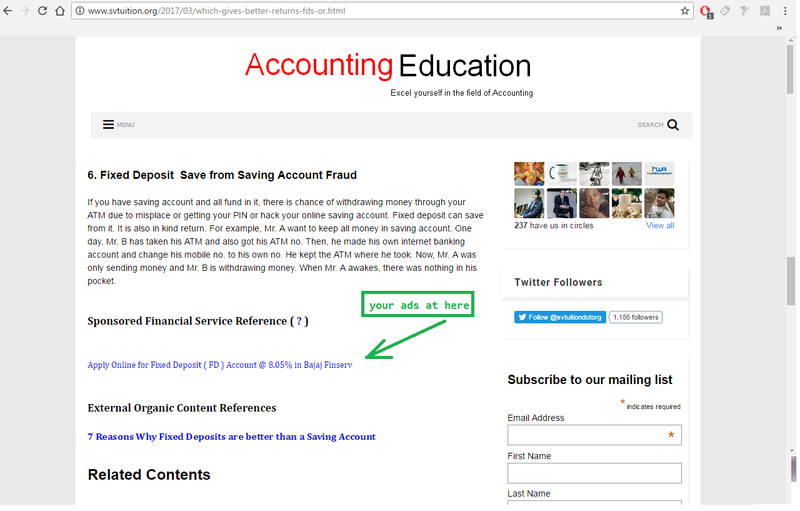 If you are selling accounting, finance and educational products, you can find many buyers at this website. Our Reach : More than 471000 page views per month of this website. More than 7500 email newsletter subscribers. Now 19100 Views per on (23-03-2017). Audience Demos : Both Male and female audience on this website age between 18 to 40 years. Users of this website are either well-educated or doing studying in school and college. Social Media : Facebook followers are 17,000+, Google+ Followers are 500+, twitter followers are 1000+.